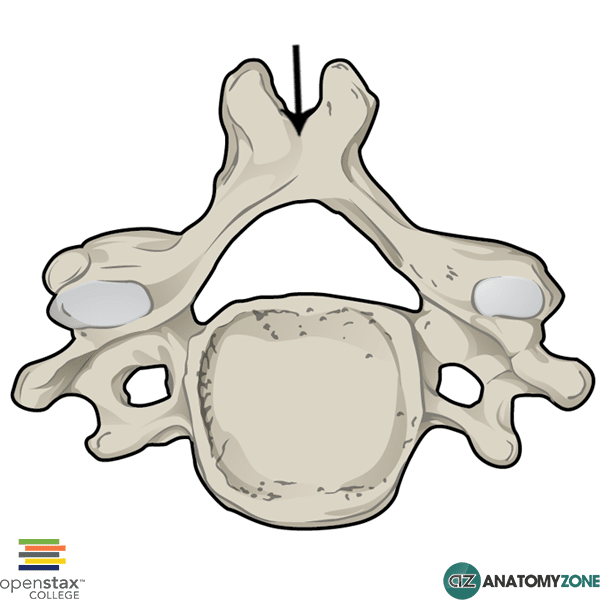 The structure indicated is the spinous process of the vertebra. The vertebral arch extends posteriorly from the vertebral body, comprised of two pedicles which extend from the posterolateral aspects of the vertebral body to join the two laminae on either side which complete the vertebral arch and enclose the vertebral foramen. Projecting posteriorly in the midline from the vertebral arch is the spinous process, which varies in morphology depending on the location in the spinal column. The spinous processes serves as points of attachment for several ligaments and muscles.